Peter has had an interest in the City since he started at IBM Basinghall Street in 1972. Interestingly, one of his first presentations at IBM was on the Livery Companies. Little did he know then how involved he would become with the Livery movement! Growing up in Hampton, Middlesex, Peter was educated at Orleans Secondary School, Thames Valley Grammar School and Twickenham Technical College. Recently he spent a year at SOAS part time learning Arabic in 2014. After a brief foray into retail banking and the operations side of IT management, he joined IBM in the City. During his twenty years at IBM, he held several Business Support and management roles. One highlight was being on the replacement pan European fulfilment system, valued at UD$ 500M, as a user manager for the UK. In October 1992 he left IBM to set up a consultancy business. He remains Director of the same company with his partner Paul. Initial clients were Prudential and Key Finance, a residual investment leasing company. Peter has been a member of the Kensington & Chelsea Chamber of Commerce since 1993, becoming a Director and later Chairman in 1998. In 2002, he returned to general management as Acting Head of the Tax Faculty, ICAEW, followed by consultant to the then Technical Director. In January 2003, he headed what was to become the Operations Department of Technical, ICAEW as a permanent member of staff. Peter’s Livery career started In July 2006 when he was admitted as Freeman to the World Traders, being clothed a year later. 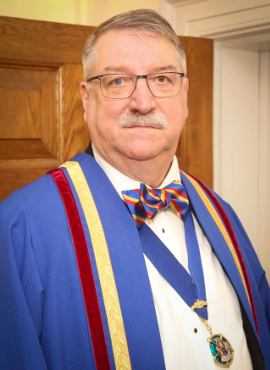 He joined the Events Committee in 2008, was installed as Honorary Treasurer in April 2012, and as Junior Warden in October 2017. In February 2014, he was elected as Trustee and Honorary Treasurer of the charity, Verification, Monitoring and Training Information Centre (VERTIC). He was elected Chairman in 2016. Peter’s partner is Paul Benbow and they have been together since March 1989, receiving their Civil Partnership in June 2006 at Fulham Registry Office. Paul is an accountant who looks after several small businesses in the south west London area. Peter and Paul are both looking forward to supporting Alderman Professor Michael Mainelli and Dr Edwina Moreton, before serving as Master and Consort in 2019–20.